Creating a new brand is, more often than not, a very complex undertaking. A large number of tasks and critical decisions face brand strategists and there is precious little room for error. The list is long and includes everything from critical elements like name choice and trademark to brand platform and positioning to visual identity decisions. There are also many work streams to coordinate: research, strategy, graphic design, messaging, communications materials, web development and digital outreach, and on and on. Of all of these, however, we feel that properly and carefully addressing and engaging key audiences throughout the process should be at the top of the list. 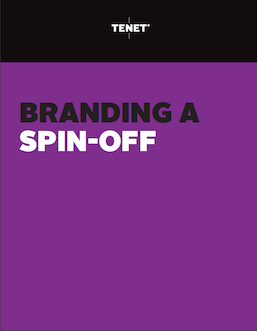 In our decades of experience helping companies of all sizes launch new brands, Tenet has identified three overarching issues that must be dealt with in spin-off situations.